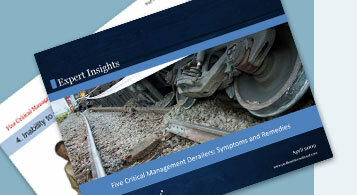 Research shows that one of the top five management derailers is poor interpersonal and communication skills. Poor interpersonal and communication skills seem like they would be obvious enough to detect, but some managers may overcompensate for their lack of communication. This is compounded by the fact that the higher managers rise in an organization, the more likely they are to develop blind spots that increase their risk of failure. Why do front-line managers fail, and what can be done to avoid failure? To remedy an "at risk" manager, try to understand the true root cause of conflict. Does your manager have a personal or political problem with just one or two people, or does your manager have more significant issues with a number of different people? If the conflict stems from a small personal issue then mediate a resolution immediately rather than letting it fester. If it is a more serious issue, consider relocating or removing that manager. Understand the manager’s management style and motivation. Some people just aren’t cut out to be managers, although they may be exceptional individual contributors. Other people just don’t want to be managers. And while some people may have what it takes to lead, they might not have the skills or experience to do the job. If your manager’s issue is the latter, it may be easier to help him develop his skills than it is to train someone who completely lacks the behaviors and interests that lead to success. Help the manager understand his own management and communication style. In many situations managers simply don’t know what they don’t know. For example, if he comes across as insensitive or aloof, point out the behavior and help him improve. It is important for the manager to understand his natural management style and how it impacts others both positively and negatively. The manager can’t be expected to improve if he never receives concrete feedback. Communication is crucial for managers to master. Management derailers inhibit the productivity of employees, but they also inhibit the manager's ability to progress professionally. Understanding the root of the conflict and the manager's personal management style will enable business leaders to better understand what solution would best fit the situation. Once the manager has a chance to understand their mistakes, the company can then decide if they would like to move forward with that manager or find someone more capable.